Why are women inventors important? 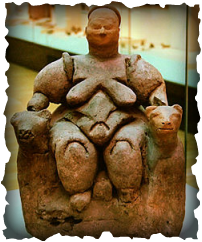 Ancient artifacts reveal that women were responsible for a large aspect of the food consumption and nutrients which could reveal the sexual politics of the ice age. 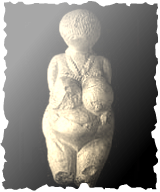 Venus figurines have been found which are dated back to 26,000 years ago depicting women in their natural state and are thought to have been symbols of early sexual stereotypes according to experts. Years of analysis has lead researchers to question the focus on male hunters in ancient societies and switched their focus on women. Supporting evidence suggests that women and children participated in hunting and drives, laid spring traps and set snares. Women are also thought to have been responsible for the invention of net hunting, the most used method of hunting during the ice age. In the Neolithic town of Catalhoyuk, Turkey, one of the largest known settlements of its time is known for its interesting architecture. Women and men walked on the tops of the roofs to get from one side to another with domestic areas in the bottom of the stone buildings. Inside of the buildings one can find drawings depicting humans and animals and many clues that suggest the nature of how this town ran. Statues depicting women in Catalhoyuk are said to be powerful representations of the roles they played in this society. Not only were women vital in the Catalhoyuk society they have played an important role in inventing things as early as the ice age such as the digging stick and forms of net-hunting which were the primary way to catch cattle. These people buried others in a fetal position inside of the cement walls of their homes. 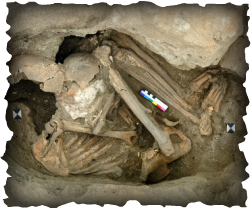 Archaeological findings suggest that women and men played equal roles in this society which was determined by the examination of their remains. 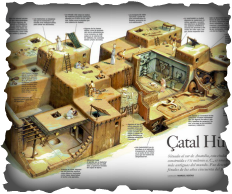 These proved that the Catalhoyuk men and women had the same nutritional intake and cultural status.